AllThingsDigitalMarketing Blog: Matt Lauer, reaches the BIG 055 on December 30th: Happy Birthday to you! Matt Lauer, reaches the BIG 055 on December 30th: Happy Birthday to you!
" We fine broadcasters for using four-letter words, we say that's offensive. So is it offensive to call for the assassination of a world leader? " According to many in the NYC streets, Matt Lauer has been naughty to his former co-anchor, Ann Curry. But that doesn't mean we shouldn't celebrate his big 055 Birthday! Happy 55th birthday to Matt Lauer, American television journalist best known as the host of NBC's The Today Show since 1996. Born Matthew Todd "Matt" Lauer in New York City, (December 30, 1957) to Marilyn Kolmer, a boutique owner, and Jay Robert Lauer, a bicycle-company executive. His parents divorced during his youth, and his father died in 1997. Lauer was married from 1982 until 1989 to a television producer named Nancy Alspaugh. The marriage ended in divorce. From 1989 until 1996, he dated Kristen Gesswein, a television newscaster. They were briefly engaged. In 1998, he married Annette Roque, a Dutch model known as "Jade." During Roque's pregnancy with their third child in 2006, she and Lauer separated. Although Roque filed for divorce in Manhattan Supreme Court on September 13, 2006, the couple subsequently reconciled. Lauer became co-host of The Today Show replacing longtime host Bryant Gumbel in early 1997. Prior to that he was a news anchor in New York City and a local talk-show host in Boston, Philadelphia, Providence and Richmond. "We fire broadcasters for wearing flats with colorful clothes and for having gray hair, we say that's offensive. So would it be offensive to ask Matt Lauer to wear multi-colored, leopard platform stilettos?" ~~ Gloria Buono-Daly American blogger, AllThingsDigitalMarketing.com founder, responsible for photo-editing this wikimedia photo (above left) of Lauer in stilettos. 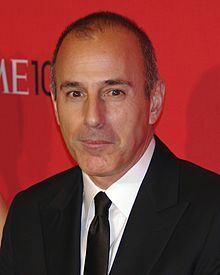 On the April 5, 2012 program, Lauer announced he had come to terms on a new contract with NBC News that will reportedly pay $25 million annually. 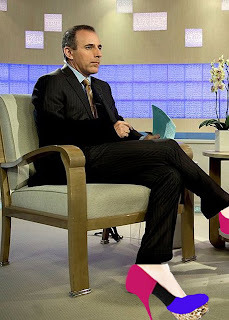 Do you think Lauer should walk a mile in Curry's shoes? Just think of the places he'll go (if he doesn't trip) and of how stiletto-high the Today ratings would go? On June 28, 2012, Matt Lauer's then co-host Ann Curry, announced her controversial departure from the today show and it was reported that Matt Lauer was 100 percent behind Ann Curry's ousting. Also it was widely rumored that he fathered a child with Today show coworker, Natalie Morales. Don't know how to take this but still brought me a few laughs. LOL. Well Happy Birthday to Matt Lauer. All I can say is that we need to know what the real reasons were for Ann Curry getting fired. If Lauer didn’t have anything to do with it then he doesn’t deserve this. Recently, Al Roker, stated that Lauer did not have anything to do with Curry’s firing. I did find your photo of Matt in leopard platform stilettos hilarious and your paraphrase of his quote quite entertaining.